Here is a little bit of history, my friends. Do you remember another government shutdown, the one that started in December of 1995? I am thinking about it because of the fury it caused. The shutdown forced the closing of the blockbuster Vermeer exhibition at the National Gallery in Washington D.C. Thousands of tourists visiting the capital were hoping to see this exhibition featuring Vermeer’s paintings, including his famous Girl with the Pearl Earring. L: Johannes Vermeer. Girl with a Pearl Earring. 1665. [Public domain], via Wikimedia Commons. R: Statue of Liberty. New York City. Image credit: Public Domain. 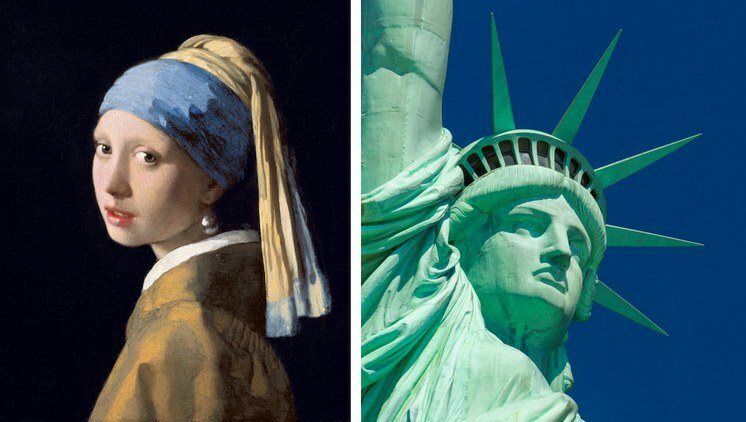 People were furious to be denied a once-in- a-lifetime chance to see Vermeer’s rare paintings here, in the U.S. More than 20 years later, during the recent government shutdown, the Statue of Liberty – the major cultural tourist attraction in New York – was kept open. Hooray to Andrew Cuomo, New York Governor, who made the smart decision to use state funds to keep this American symbol of liberty open and accessible to all without interruption. L: Digital rendering of Jeff Koons' "Bouquet of Tulips," 2017. © Jeff Koons, courtesy of Noirmontartproduction. R: “Train" by Jeff Koons. Credit: Los Angeles County Museum of Art. Here’s more about culture and politics. Recent news from France is that Parisians have turned their noses up at Jeff Koons’ gigantic sculpture, Bouquet of Tulips. 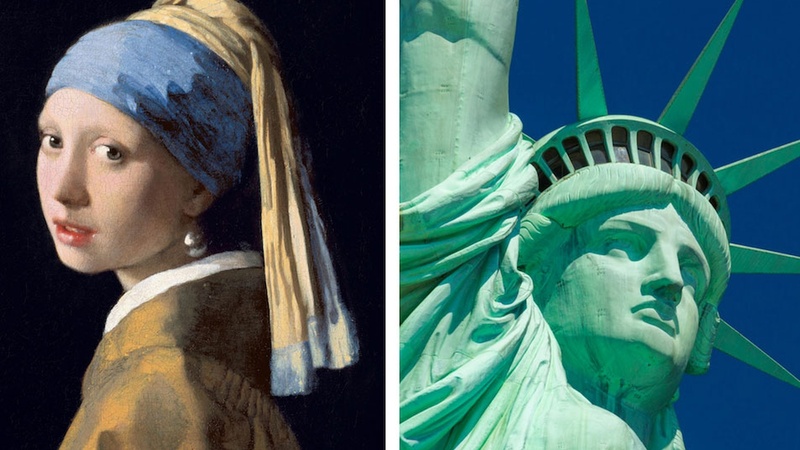 It’s meant to be an homage to the victims of the 2015 Paris attacks, and definitely has direct references to the hand of Lady Liberty holding a torch. But, what a banal and lackluster proposal it is. 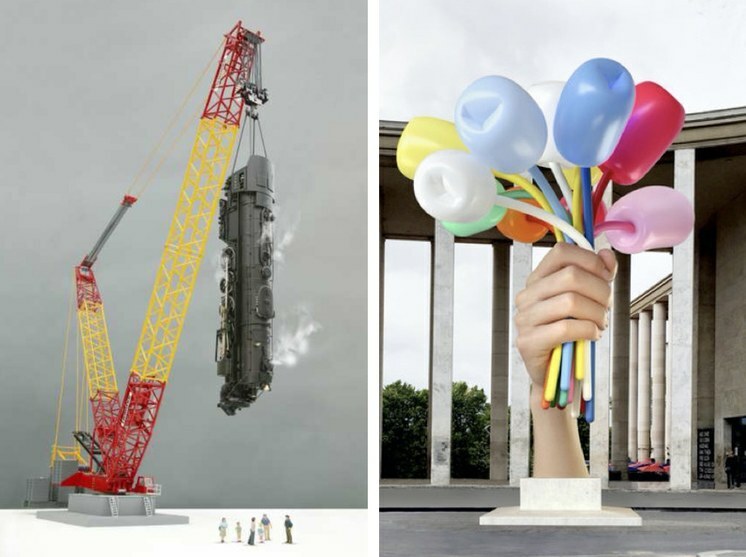 It reminds me of another Jeff Koons monstrosity – a gigantic sculpture of a locomotive train suspended from a life-size industrial crane. First, it was rejected by Parisians in 2005, and then, thankfully, by Angelenos, a couple years later. 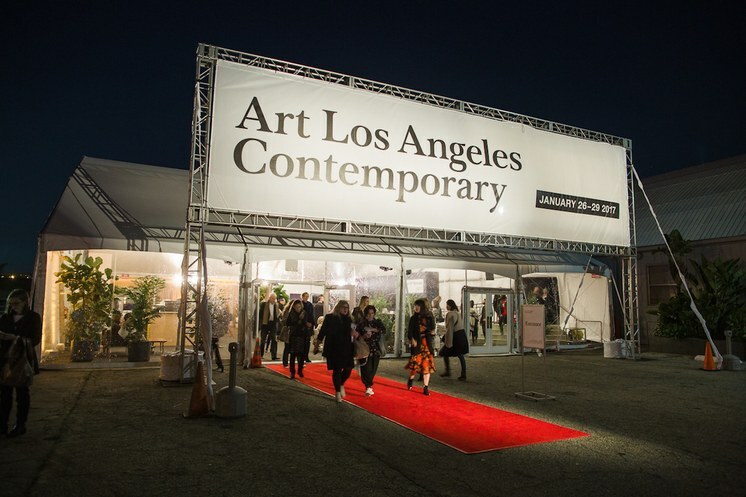 Now, on the positive side, let’s talk about the upcoming art fair this weekend at Barker Hangar at the Santa Monica Airport, Art Los Angeles Contemporary – January 25-28. It’s one art fair in Los Angeles that I never miss, because of its adventurous and bohemian spirit, which makes it so much more enjoyable compared to other commercial art fairs in the city. Visitors are offered not only a variety of cutting-edge art represented by several dozen national and international galleries, but also public performances, artist talks, and a music series. Poster of “David Hockney at the Royal Academy of Arts”. Image courtesy Laemmle. 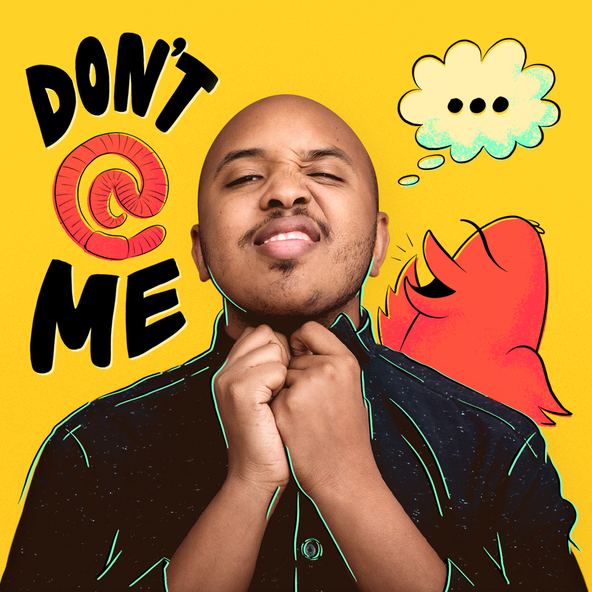 And here is one more art happening I want you to know about. 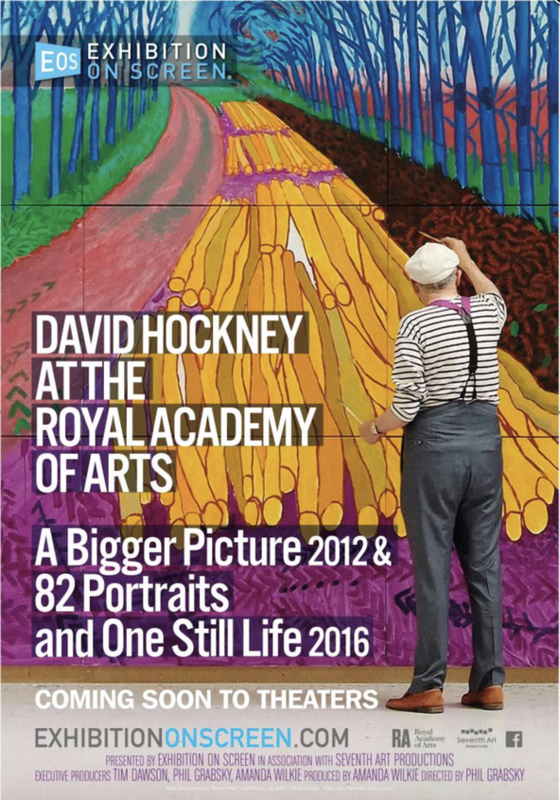 It is a rare screening of a documentary about David Hockney and his two gigantic exhibitions at the Royal Academy of Arts in London over the past several years, David Hockney at the Royal Academy of Arts. You can catch the movie at Laemmle theatres on Monday January 29 at 7:30 and Tuesday the 30 th at 1:00. Ed Moses at William Turner Gallery, 2016. Image courtesy William Turner Gallery. Last week brought sad news about the passing of Ed Moses (1926-2018), one of the most feisty, prolific, indefatigable artists I have ever encountered. Ed kept working literally until the last days of his life. 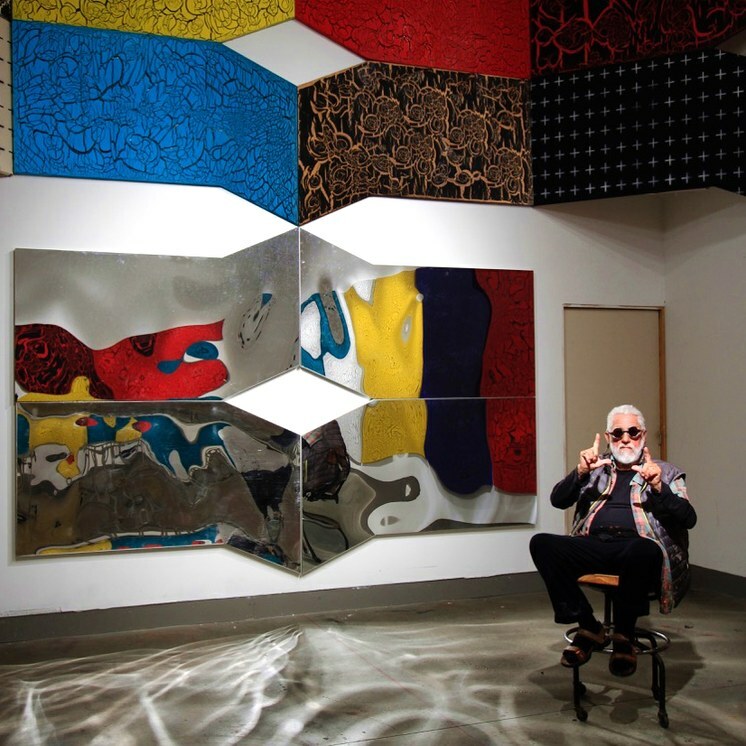 Take a look at the photo of him on our website, sitting in the midst of his 90 th birthday exhibition installation at Bergamot Station. Installation image of "Moses y Cujo" by Ed Moses at Ernie Wolfe Gallery. 2014. Photo by Edward Goldman. Or, another photo of his crazy – and I mean deliciously crazy – installation at Ernie Wolfe Gallery, which made me think that earthquakes turned everything in the gallery upside down, to the most delightful affect. The young spirit of Ed Moses’ art will stay with us for years to come.